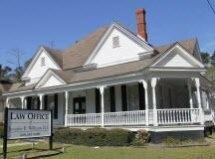 At the law firm of Jennifer E. Williams, LLC, in Valdosta, Georgia, we provide comprehensive legal services in the areas of family law, personal injury and workers' compensation. In the process of resolving any legal issue, the quality of your representation can go a long way toward ensuring a favorable outcome. When you choose Attorney Jennifer Williams to handle your case, you can rely on her to pursue every available option in an effort to resolve the matter in a way that provides the most benefit to you and your family. From seeking fair compensation and benefits in a personal injury or workers' compensation claim to protecting your interests in complex family law matters, we are committed to obtaining the best possible result for you. We have the experience, the skill and the resources to properly investigate your case. Whether through negotiation or litigation, we are prepared to do whatever it takes to bring your case to a successful conclusion. Contact Jennifer E. Williams, LLC, to discuss your family law, personal injury or workers' compensation case with a lawyer. We offer a free initial consultation to all new clients. Attorney Jennifer Williams is available during regular business hours and by appointment at other times.